OK, I have discovered the greatest idea for an event ever. You know those places you can go with a bunch of friends and drink wine while learning to paint a picture – or any of the number of other similar events? 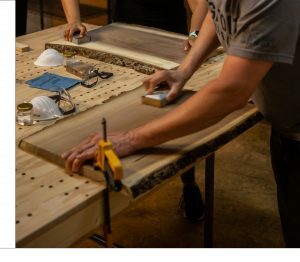 Well, in Toronto, the fine folks at Lavigne & Co Design host The Charcuterie Board Workshop – where you and your mates make a charcuterie board, as in the actual board (and then get to eat some fine fare). I found out about The Charcuterie Board Workshop too late to partake in one on this trip, but I am totally keeping it in mind for a future visit. Learn more about The Charcuterie Board Workshop here. Lost Cowboy is powered by	WordPress 5.0.4 and delivered to you in 0.789 seconds using 45 queries.